Get your adrenalin pumping with Kiwijet boat tours and 4 times NZ Jet Boating Champion Bill Roberts as your guide. You’ll see the magnificent Ignimbrite walls of the Matahina Dam; you’ll travel up the majestic Matahina Lake and into the Rangitaiki River, and then encounter white water rapids in a scenic sweeping gorge that makes its way to the Aniwhenua Falls. Hold on tight and enjoy! Water-skiing is a very popular activity in the Bay of Plenty region – our smooth-topped lakes are ideal for the sport. Lakes Rotoiti, Rotoma, Rotorua and Tarawera are all approximately a 1 hour drive from Awakeri Hot Springs’ Holiday Park. The nearby Rangitaiki River is a veritable playground for white-water rafters. 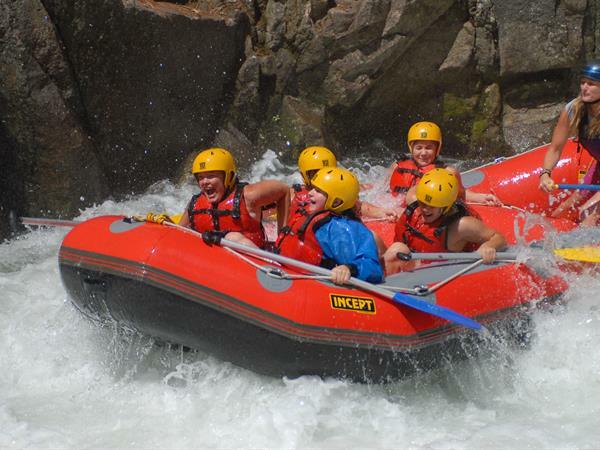 River Rats is one company that have been professionally rafting the Rangitaiki for over 20 years. Join a group on a memorable kayak trip down the tranquil and safe Waiokea River. The river runs languidly through New Zealand’s largest nature reserve. Of course, the stunning lakes in this area are also great for exploring by kayak. If all this sounds a little exhausting, just find a secluded waterfront spot to enjoy a picnic or get your head into a good book!